The Idleness Labouritory creates events that challenge modern ideas of labour and idleness to make propositions for an aesthetic ethos of co-creative experience. The Lab develops performative projects and practices, methodologies, tools and experiences that resist narrow constructions of idleness as unproductive and labour as productive, and in the process, construct opportunities for lucid, creative and critically enquiring modes of activity. With project participants, our activities build creative practice methodologies that enact propositional relationships to exchanges of value, communities of practice, economies, material conditions and ecosystems. Our activities are guided by performative ways of questioning, exploring and attributing value in contemporary creative arts research practices. The research aims to contribute to debates on creative practice research, and provide example of practice methodologies that posit the kind of re-orientations necessary to engage with current challenges facing living systems, including human society. “Attuning” (Point of Contact Gallery) explores acoustic exchanges of human and non-human elements, including embodiments of language and material resonances, and re-distributions of auditory experiences. “Attending” (Everson Museum of Art) explores adjusted relations between the human bodies of gallery staff and visitors to elicit shifts in the aesthetic perception of art experience relevant to contemporary challenges. “Gesturing” (1067PacificPeople) explores the temporary construction of creative exchange encounters through value invested in embodied gestures. Reading Labours inhabited and experimented in the spaces and temporalities traversing conditions of idleness and labour. The Lab dwells on idleness as a lost art, a forgotten past time, a habit neglected by contemporary life, where notions and actions of work have consumed what was once sacredly free, unfettered and poignant. Work and life are no longer duelling partners but zones of occupation that have merged, often indistinguishable from one another, with varying consequences unevenly distributed in societies. From the factory to the academy, the fields to the office, incentives, even mandates, to be utterly productive, connected, and a good consumer dominate bodies of all shapes, classes and occupations. The culminating 24-hour immersive performance explored methods and embodied practices related to voice, spatiality, temporality, patterning, circadian rhythms, body work, sonics, rhythm, scoring and group repartee. 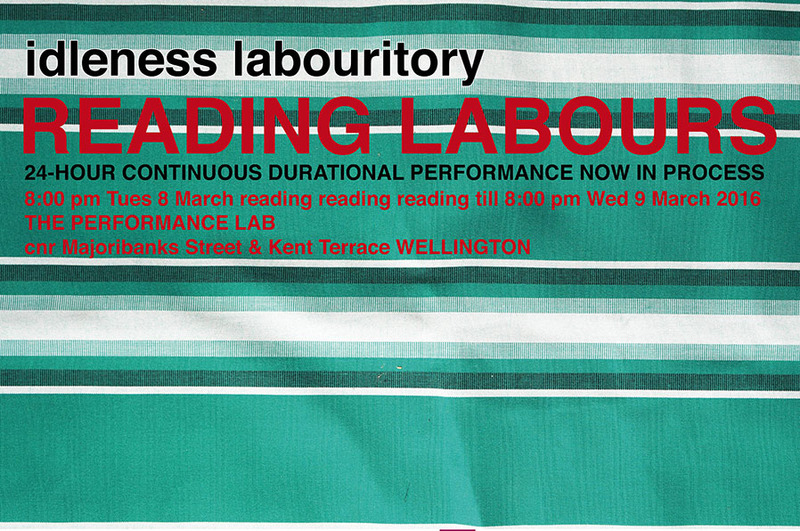 In the process, embodied acts of reading, writing, sleeping, eating and probably dreaming shaped our experience, made accessible to the street-level passing-by Wellington public through the glass building facade and an amplification of sound from inside the Lab to the street.